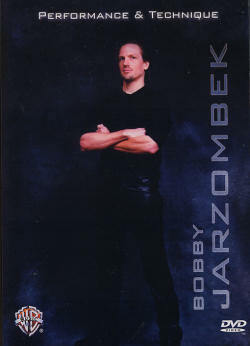 Bobby Jarzombek, best know for his work with British metal vocalist Rob Halford, has put together his first DVD titled Performance & Technique. Let's check it out. Peppered Cancer: This song, co-written by Bobby, is an up-tempo tune featuring odd time signature changes and lots of Bobby's trademark double bass chops. Drum Solo #1: Bobby demonstrates his ample 'show' skills, which include cross sticking and visual stick tricks. My Approach to Drumming: Bobby discusses his basic approach to drumming (open-handed technique) and double bass drum patterns. He also includes advice on learning to read and write music and ear protection. So It Ain't: This song, also co-written by Bobby, is in a Latin vein. Live in Japan: This live performance shows Bobby's drum solo skills up close and personal. Visuals: This segment consists of Bobby demonstrating and teaching his favorite stick tricks, which include stick twirling, tosses, and backsticking. Drum Solo #2: Bobby pulls out all the stops as he gives us a sampling of his visual solo skills. Double Drop: This segment includes 11 exercises that consist of some of Bobby's favorite double bass patterns and sticking interactions. School: This third tune, again co-written by Bobby, features a cool superimposed triplet feel. Included are segments of Bobby visiting and choosing cymbals from the Paiste cymbal factory, behind-the-scenes footage of Bobby playing in the studio with Bobby himself narrating the proceedings and offering lots of tips, sound checking his drumset prior to a show, photo gallery, and PDF files of Bobby's Double Drop exercises. Although the title of this DVD might cause you to think that it covers hand and foot technique in general, it concentrates on Bobby's double bass technique and favorite visual stick tricks. As such, if you're into double bass and exciting visual eye-candy, you'll find some good stuff here. In addition, if you're new to the studio scene, Bobby includes lots of valuable tips and tricks for studio work, sound checks, and more. I recommend it.